Hello, and welcome to JT Hughes. Today I'll be showing you around one of our pre-registered Hondas. This one is a Honda Jazz. It's the 1.3-litre 100-brake horsepower petrol SE model and it comes with a manual gearbox. This one comes with 15-inch alloy wheels, front and rear parking sensors, which gives you an audible guide when reversing or when going into quite a tight parking space. The Jazz is absolutely famed for its gigantic sized boot, but very small exterior. As you can see, fantastic size boot. Those seats will fold down on a 60/40 basis, and they'll go down absolutely flat. One of the best features of the Honda Jazz is its Magic Seat facility, which entails just lifting the base of the seat up, which will lock into place, offering a fantastic amount of room for storage. This one comes with cloth interior, and has delivery miles only on it. Just show you inside the vehicle now. Finance is available on this vehicle, whether that be hire-purchase or the more popular personal contract purchase, subject to availability and terms and conditions. You can also buy a service plan for this vehicle, and it comes with a three-year warranty from new, which you can also extend. Now, this one has cloth interior, height-adjust on the driver's seat. Very nice place to be sat, very easy to use with your automatic lights and automatic wipers which come on for you, so you don't have to do any input, in regards to that. Your 7-inch touchscreen display controls everything to do with your radio and your information. Modern-day connection points are situated down below, and also air conditioning. This one comes with the hands-free telephone kit and many more features, which we can go through once you pop down. 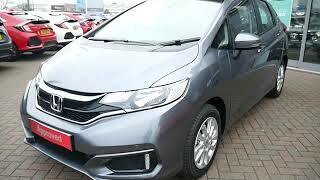 So there we have it, our pre-registered Honda Jazz. For more information on this particular vehicle, please contact JT Hughes of Shrewsbury. Use our simple finance calculator to work out how much this car will cost you per month. You can add in your part exchange, any outstanding finance and any cash deposit. We’ll also give you competing quotes on Hire Purchase and Personal Contract Purchase (PCP) where available, all at our hassle-free low rate. PCP payment is not available for this vehicle. HP payment is not available for this vehicle. This is not an offer of credit and is an example of what may be available; please also note that finance is available subject to status, terms and conditions apply. Applicants must be over 18 years and indemnities may be required. We are a credit broker not a lender. We can introduce you to a limited number of lenders and finance products to assist with your purchase, who may pay us for introducing you to them. We will not charge you a fee for this service. Some providers do charge an option to purchase fee of £10 which must be added to the final payment. Full written quotation on request. Is PCP right for you? Do you want to leave a low deposit and have lower monthly payments? Do you want to avoid the maintenance costs of an ageing car? Using your annual milage, we work out what your car will be worth at the end of the agreement (known as the ‘Guaranteed Future Value’). Your payments are based on the difference between the original price of the car and the Guaranteed Future Value (plus interest and charges). Because you’re not paying off the whole cost of the car, we can keep your payments low. At the end of the agreement you can choose to return the car to JT Hughes or trade it in for a new car without having to pay of the Guaranteed Future Value. If you want to keep the car, you just need to pay off this charge to own the car outright. Is HP right for you? Your monthly payments are based on the difference between the price of the car and the deposit* amount, plus any interest charges. You can make your payments over one to five years depending on your budget. Excellent service from Jay at JT Hughes in Shrewsbury, looking forward to driving my new hybrid crv away today . Look forward also to our next deal in the future. Fresh from Frankfurt: New Look Jazz Arrives This Month! More powerful, feature-packed and passenger-friendly than ever – could the new look 2018 Honda Jazz become even more popular? View and read a comparison between the 2016 Honda Jazz and older model. Whilst every effort has been taken to ensure the accuracy of the above information and the picture and video created from it, some inaccuracies may occur. Please check with your local JT Hughes Honda, Mitsubishi or Hyundai branch about any items which may affect your decision to buy this vehicle. This vehicle may have been sold in the last 24 hours. Please call or email any JT Hughes branch to confirm the vehicle is still available. Recommend this vehicle to a friend by completing the form below. Representative Example: Monthly payments of £66.66 | Number of Monthly Payments 60 | On the road Cash Price £10,000.00 | Deposit £6,000 | Interest payable 0% (Fixed) | Total amount of credit £4,000 | Total amount payable £10,000.00 | REPRESENTATIVE APR 0% Up to 5 Years 0% APR Representative finance available on this used car, 0% offer is available subject to amount of credit and term required, terms and conditions apply. Full written terms and conditions available on request. *Please note that the finance calculation shown is only a representative example and is not necessarily applicable to this car. Please note that for security and training purposes all of our telephone calls are now being recorded. JT Hughes(Oswestry) Ltd which is authorised and regulated by the Financial Conduct Authority for insurance mediation activities only. All calls may be recorded for training, monitoring and quality purposes. Copyright: © JT Hughes (Oswestry) Ltd: All rights reserved. Users may download and print extracts of content from this website for their own personal and non commercial use only. J. T. Hughes (Oswestry) Ltd, 5 Battlefield Road, Shrewsbury, SY14AB. Our FCA number is 306434. You can check this on the FCA's register by visiting the FSA's website or by contacting the FSA on 0800 111 6768. We subscribe to the Motor Industry Codes of Practice for New Cars and for Service and Repair and are members of the National Franchise Dealers Association. Click here for more details. Special offer: Buy Now. Pay Later. Terms & Conditions: Offer only applies to Honda Jazz SE Manual and Automatic. Cars must be registered in March 2019. Example Jazz SE Manual OTR £15860* Pay 50% £7930 on purchase and £7930 in 12 months’ time 0% interest Total amount payable £15860. Please also note that finance is available subject to status, terms and conditions apply. Applicants must be over 18 years and indemnities may be required. We are a credit broker not a lender.. Full written quotation on request *Excludes Metallic paint.